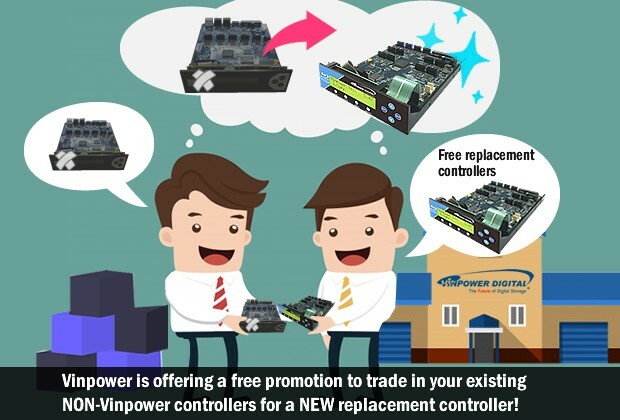 Vinpower is offering a free promotion to trade in your existing NON-Vinpower controllers for a NEW replacement controller! If you are a reseller or even an end user and you have any new or used, working or non-functional SATA duplicator controller(s) in your possession, Vinpower is willing to offer a special trade-in offer* to trade it in for a fully functioning Vinpower controller! That means, if you have an old SATA version ACARD, Wytron, or any non-Vinpower manufactured controller in your possession, working or not, and trade it in to Vinpower, we’ll give you the choice to take 30% off a new replacement controller or we’ll give you a free Vinpower controller for every 3 non-Vinpower controllers you trade in. You heard that correctly, if you have any non-Vinpower manufactured (meaning Vinpower branded or Vinpower OEM versions) controllers, Vinpower will offer you either 30% discount towards 1 new Vinpower controller or a completely free replacement for every 3 trade-ins. I wanted to reemphasize the promotion so you understand we are serious and you can receive more than 1 free controller. • Contact Vinpower to set up an RMA for any existing SATA controller you have in stock or built into a duplicator. • These controllers do not need to be operational, but they must be natural SATA connection version (NO IDE models). • The controller must not be manufactured by Vinpower, including OEM controllers Vinpower supplies as an OEM brand. • There is a limit of 15 trade-in controllers per address, every 3 will be eligible for a free replacement controller. • Quantities less than 3 qualify for a 30% discount on each controller, towards a replacement Vinpower controller. • All Vinpower replacement controllers will come with Vinpower’s proprietary CopyLock copy protection feature FREE! • Valid through June 30th, 2019 from Vinpower direct locations only, contact us at [email protected] for more details on where. Don’t let this promotion pass you by, it’s your opportunity to upgrade 1 or up to 15 lesser controllers for the latest and greatest controllers on the market! For more details about this opportunity or any product that Vinpower offers, please visit our website, www.vinpowerdigital.com or contact a Vinpower representative today.